The Bangor Savings Bank on Somerset Avenue in Pittsfield can be seen in this February 2014 file photo. 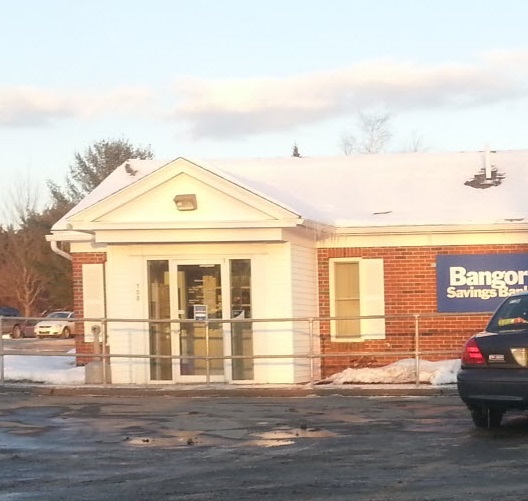 Bangor Savings Bank announced Friday that it will consolidate four of its branch locations -- Howland, Farmington-Mount Blue, Hartland and East Millinocket -- into nearby branches. BAnGOR, Maine — Bangor Savings Bank announced Friday that it will consolidate four of its branch locations into nearby branches. The branches that will be closed as a result of the change are Howland, Farmington-Mt. Blue, Hartland and East Millinocket. Howland branch customers will use the Lincoln branch; Farmington-Mt. Blue will move into Farmington-Main Street; Hartland customers will go to the Pittsfield branch; and East Millinocket customers will use the Millinocket branch. Subject to regulatory approvals, Bangor Savings Bank anticipates that the consolidations will begin as early as March 25, 2016, and be completed by the end of June 2016. All four of the closing branches are within 12 miles or less from other branch sites. “Like many banks, we’ve seen changes within the banking industry as well as slow but steady migration toward alternative banking channels, which have resulted in decreasing activity in some of our branches,” said Susan Snowden, executive vice president and chief consumer officer, explaining the move. The bank notified its customers of the change by mail on Wednesday, according to its news release. “Consolidating branches is a rare event for our bank and not a decision we made lightly,” Snowden said in the release. Employees of the closing branches will be given comparable positions at other locations, Snowden said. “We deeply appreciate our customers who chose to do business with us at these four locations and hope to have the opportunity to continue to serve them at our other branch locations as well as with our comprehensive online banking services at www.bangor.com, mobile banking and phone banking that allow our customers to do their banking from anywhere, anytime,” Snowden said. Bangor Savings Bank, founded in 1852, has 57 branches.